Brazilian superstar Neymar flew into Rio de Janeiro early Thursday ahead of an operation on his fractured foot that will rule him out for up to three months, casting a long shadow over Paris Saint-Germain and Brazil’s World Cup preparations. The world’s most expensive player, 26, arrived on an Air France flight from Paris and left in a wheelchair, a photo taken by one of his fellow passengers showed. Dressed in a black hoodie, a black baseball cap and wearing sunglasses, the PSG star smiled and took selfies with passengers, before leaving on a private jet to an undisclosed destination. Surgery will take place Saturday, national team surgeon Rodrigo Lasmar said. But despite the hurry to put Neymar under the knife at a hospital in Belo Horizonte, he won’t be back on the field soon. “The (recovery) period will be around two and a half to three months,” Lasmar, said after arriving with the player on the same Air France plane. The injury has not only ruled Neymar out of PSG’s do-or-die Champions League clash with Real Madrid but now threatens the much fancied Brazilian national side’s build-up to the World Cup, which starts June 14. On Tuesday, the Brazilian’s father had claimed the player would be out for “at least six weeks”. 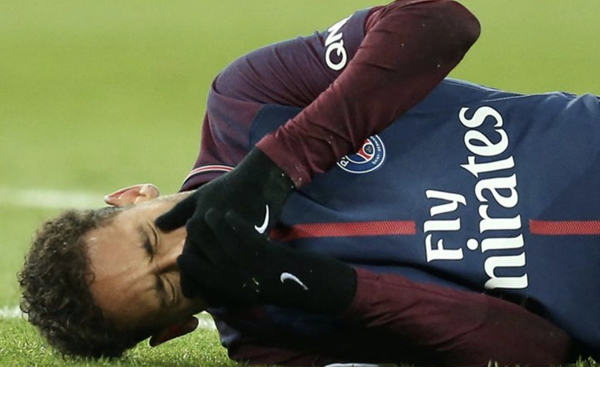 – Tiny bone, big problem – Neymar suffered a hairline fracture of the fifth metatarsal in his right foot as well as a twisted ankle late in PSG’s 3-0 win over Marseille in Ligue 1 on Sunday. Speaking to ESPN in Brazil before PSG’s announcement, the player’s father, Neymar Senior, said: “PSG know that they will not be able to count on Neymar for the upcoming matches.” PSG coach Unai Emery had said earlier that there remained a “small chance” of getting him back in time to face Real next Tuesday, March 6. That chance has now gone. PSG lost 3-1 in the first leg in Spain two weeks ago and are in danger of being knocked out of the competition in the last 16 for the second season running. Neymar appeared to be in tears as he was stretchered off the field at the Parc des Princes on Sunday. He has scored 28 goals in 30 appearances in all competitions for PSG since his world-record 222 million-euro ($264 million) move from Barcelona last August.